Rub all sides of each rib generously with salt and pepper. Heat enough olive oil to coat the bottom of a large Dutch oven (7-8 Quarts). When the oil is hot, brown all sides of the ribs well. Transfer the ribs to a plate. When all ribs are seared brown, turn heat to medium and remove all but one tablespoon of oil and fat. Add onion and season with salt and pepper. Cook until slightly brown and softened. Add the garlic cloves and cook for 3 more minutes. Add the tomato paste until the mixture is thickened and add the balsamic vinegar, Worcestershire, and the Ledger David Cellars 2011 Malbec. Return the ribs to the liquid meaty side down. Add enough stock to cover the ribs. Bring to a simmer then remove from the stove. Bake in the oven at 325 degrees for 3 hours or until the meat can be peeled back from the bone easily. Remove from the oven and let stand for 10-15 minute. Place the separated ribs on a baking sheet and return to the oven at 425 degrees for 10-15 minutes to crisp the edges. In the meantime strain the braising liquid and return to the sauce pan to reduce the liquid by half on high heat. This will give you a very rich full-bodied sauce as an accompaniment to mashed potatoes or other mashed or pureed root vegetables. I like a mixture of parsnips, carrots, rutabagas and potatoes keeping some of the skin from each in the mash. Remove the ribs and serve with sides. Pairs with Ledger David Malbec. Britt Festival goers now have another new reason to visit the Britt Hill in Jacksonville this season. As if a new Britt Classical conductor and a new performance garden isn’t enough – there’s now a new wine on the summer line up. The request to pour Ledger David wine on the hill came from Britt organizers this past spring and Ledger David was honored to heed the call. “As a southern Oregon native, I’ve grown up with the Britt. It’s exciting to be able to partner with this organization now as a local business owner,” says Lena Varner. Ledger David Cellars will be pouring its first-vintage 2011 Malbec alongside just a handful of other reputable southern Oregon wineries. 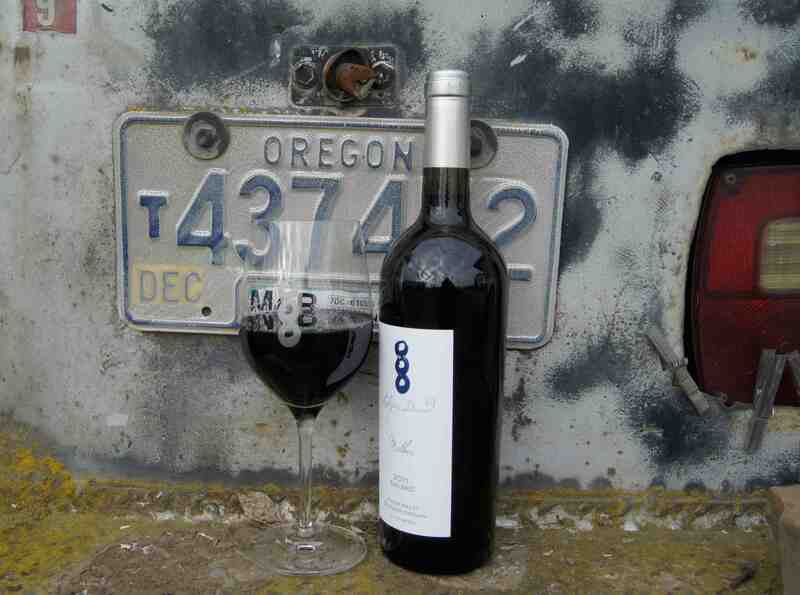 Folin Cellars and Quady North will join Ledger David in the red wine category. EdenVale, Valley View and Wooldridge Creek will offer wines in the white wine category. According to event planners, concession sales derived from food and wine sold on the Britt Hill help sustain the annual music festival. The 2011 Malbec makes its official public debut over Memorial Day Weekend, May 24-26 at Le Petit Tasting Room. The Britt Festivals 2014 concert series starts in June – official ticket sales begin on May 16. For more information, visit www.brittfest.org. 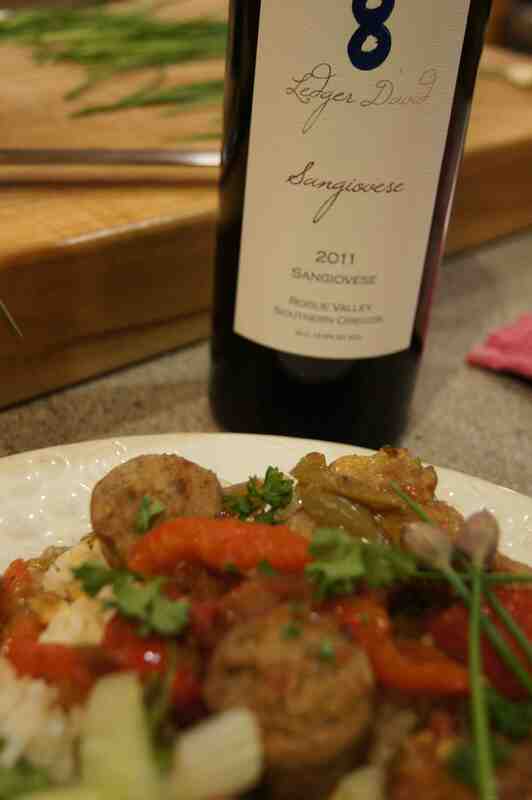 This recipe makes an amazing pairing for the 2011 Sangiovese. It looks a bit complicated, but it isn’t. It does require spending time in your kitchen though, tending to the Soffritto, brining the chicken and roasting the peppers. It is a relaxing dish to make and is a great way to enjoy a glass of wine while visiting with family or friends while you fill your home with fantastic smells. While you don’t have to brine the chicken, the effect of doing so really enhances the dish. Once you start brining, you’ll be hooked. It is simple to do and does wonderful things to your poultry, fish and other meats. The Soffritto will be the newest trick in your arsenal of awesome food tricks and you’ll want to have some around to use all the time. I encourage you to take this one on. The results are worth the effort and the Sangiovese will thank you! Cut chicken into 8 pieces (2 legs, 2 thighs, 2 breast halves, & 2 wings). Pour brine (See brine recipe below) into a container large enough to hold the chickens, add the chicken and refrigerate no longer than 12 hours (no longer or the chicken will be too salty). Remove the chicken from the brine (discard the brine) and rinse the chicken under cold water and remove any herbs or spices sticking to the skin. Pat dry the chicken or let air dry. Season the chicken with salt and pepper. Heat some canola oil in a large ovenproof sauté pan or Dutch oven over medium heat until hot. Add the chicken thighs and drumsticks and cook for three minutes. Add the sausage and cook until the chicken is golden brown and the sausage is browned and crisp. 10-12 minutes (it won’t be fully cooked); once the chicken is browned, turn the pieces over and sear the other side for 1 minute. Transfer the individual chicken pieces and the sausages to a plate as they are ready. Season the chicken breasts and wings with salt and pepper, place skin-side down in the sauté pan and cook until the skin is crisp and golden and the chicken is almost done. About 8 minutes. Transfer to a plate. Drain any remaining oil from the pan and return to the heat. Add the Pepperonata to the pan, bring to a simmer and add the chicken tucking it into the peppers. Cut the sausages in half and nestle them into the pan. Transfer to the oven and cook until the chicken is cooked through, about 5 minutes. Drizzle the chicken with olive oil, and sprinkle with fleur de sel, top with the parsley leaves and serve directly from the pan. 8 ounces Anaheim or other mildly warm peppers, drained, peeled and seeded. Preheat the oven to 375 F. Line two baking sheets with parchment paper (it makes clean up a breeze). Cut the bell peppers lengthwise in half and remove the stems and seeds. Toss the peppers with oil to coat and salt and pepper to taste. Arrange the peppers cut side down on the baking sheets, the red peppers on one and the yellow on the other. Roast the peppers until the skin is blistering, 30-35 minutes for the red and 35-40 for the yellow, do not allow the edges to blacken. Transfer the peppers to a bowl and cover with plastic wrap or place in an airtight container with a lid. When the peppers are cool enough to handle, peel them. Tear them lengthwise into strips about ¾” wide. Tear the Anaheim’s the same way. Combine all the peppers, the Soffritto, stock and chipotle in a medium sauce pan over medium heat, season with salt and pepper and bring to a simmer. Cook for 30 minutes to soften the peppers completely and meld the flavors. Transfer to a bowl or platter and sprinkle with the chives. Combine all the onions, oil, and a pinch of salt into a 8-9” sauce pan and set over medium heat. As soon as the oil starts to simmer, reduce the heat to low. It is important to maintain an even LOW heat. The onions need to stew but slowly caramelize. Adjust your heat so that the oil bubbles gently. The liquid will become cloudy as the onions release there liquid, but once the water moisture has evaporated the oil will clear. Cook for about 2-1/2 hours or until the onions are a shade darker than a golden raisin and the oil is perfectly clear. Check the pan often and scrape any onions that are caramelizing on the edges back into the oil. Meanwhile make a quick tomato puree. Halve the tomatoes and scrape out the seeds. Finely chop the tomatoes and add to the caramelized onions. Cook for 2-2-1/2 hours longer or until the onions and the tomatoes start to fry in the oil. The mixture will start to sizzle and small bubbles will cover the entire surface. Gently stir the mixture—the onions and tomatoes will separate from the clear oil. Turn off the heat and add a pinch of salt and the garlic and let the Soffritto cool. The Soffritto will keep covered in the refrigerator for a week. Drain it before using. The oil can be used to start another Soffritto. Combine all ingredients in a large pot and bring to a boil for 1 minute stirring to dissolve the salt. Remove from the heat and allow to cool, then chill in the refrigerator before using. NOTE: This is enough brine for 10 lbs. The brine can be kept refrigerated for 3 days.